In the modern, rapidly-expanding mobile learning environment, only clear guidelines and state-of-the-art technologies will stand up to the challenges that lie ahead. With a smart focus that combines a proven process with all-important strategies and practical applications, Mastering Mobile Learning stands as the most modern, comprehensive resource on the subject. It also features unique technical content previously unavailable among the literature of the mobile learning field. This book will help you turn concept into reality. Written by experts in this burgeoning field, Mastering Mobile Learning provides a roadmap for creating the most effective learning content, strategies, and applications possible. 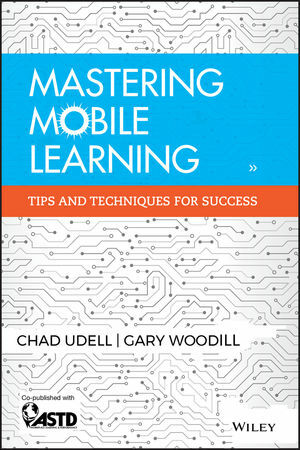 CHAD UDELL is the managing director of Float Mobile Learning. Chad is the author of Learning Everywhere: How Mobile Content Strategies Are Transforming Training and works with industry-leading Fortune 500 companies on developing mobile learning strategies that are then implemented by Float. GARY WOODILL as a senior analyst for Float Mobile Learning, he conducts research and market analyses, as well as assessments and forecasting for emerging technologies. He is the author of The Mobile Learning Edge and the co-author of Training and Collaboration with Virtual Worlds.